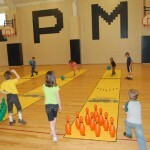 Thanks to a grant from the Penn Manor Education Foundation, Kathy Young’s physical education classes at Martic Elementary students have an opportunity to learn to bowl. Six lanes with 10 ten pins and 4 pound bowling balls were purchased with the grant money. 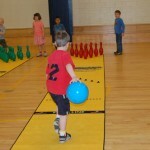 The students have learned the rules of bowling, scoring, bowling terms, and proper technique. During class, the students rotate from a bowler to a spotter (at the foul line), a scorekeeper, a pin setter and a ball carrier. 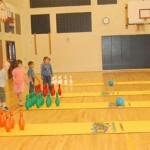 In the 2011-2012 school year, all seven elementary schools will have chance to use the bowling lanes as they travel around the district.